All tracking numbers will be released from the canceled account or subaccount. Call history and data will be kept for 60 days. You may log in to canceled accounts to review and export your data during this time. Canceled accounts and subaccounts can be reactivated at any time. You can log in to resume your subscription as needed. Contact support to reactivate canceled agencies. There is not an option to do this within your account once an agency has been canceled. Fully canceling accounts is the only way to stop charges to your credit card. Paused accounts, stopped accounts, or agency accounts that have not canceled at the agency level will still be charged for their regular subscription fee, monthly number renewals, usage, or any features with additional rates. Remaining available balances are not refunded automatically. Contact support to request your refund once your account is fully canceled. If you wish to pause number swapping for your account without cancelling, follow the instructions here. If you wish to stop incoming calls and pause number swapping for your account, follow the instructions here instead. Follow the directions below to cancel the subscription for a single account. Use the left hand navigation or scroll down to the Status section. Click the orange Cancel Account… button on the right side of the page. A confirmation screen will appear. Click Cancel Account to proceed with cancelation. Your account is now canceled. You can reactivate your account at any time by clicking Reactivate Account in the Status section of the Account Settings page. Follow the directions below to cancel a single subaccount within an agency. Note that canceling all subaccounts will not fully cancel an agency. If you are an agency owner and wish to completely cancel your subscription with CallTrackingMetrics, you will need to follow the directions for Canceling an Agency below. If any subaccounts within your agency would like to take ownership of their accounts and move them out of your agency, follow the steps to transfer accounts instead. Navigate to Settings → Accounts. Here you will a see a list of all subaccounts within your agency. Click Edit next to the name of the subaccount you wish to cancel. Double-check that the correct subaccount name appears at the top right of your screen before you proceed. Your subaccount is now canceled. You can reactivate your subaccount at any time by clicking Reactivate Account in the Status section of the Account Settings page. Click the filter button in the top left corner of the page. In the panel that appears, use the drop-down to select Canceled subaccounts. Click Edit next to the name of the subaccount you wish to reactivate. Click the Reactivate Account button on the right side of the page. The subaccount is now reactivated. You can now purchase tracking numbers and resume using the subaccount. 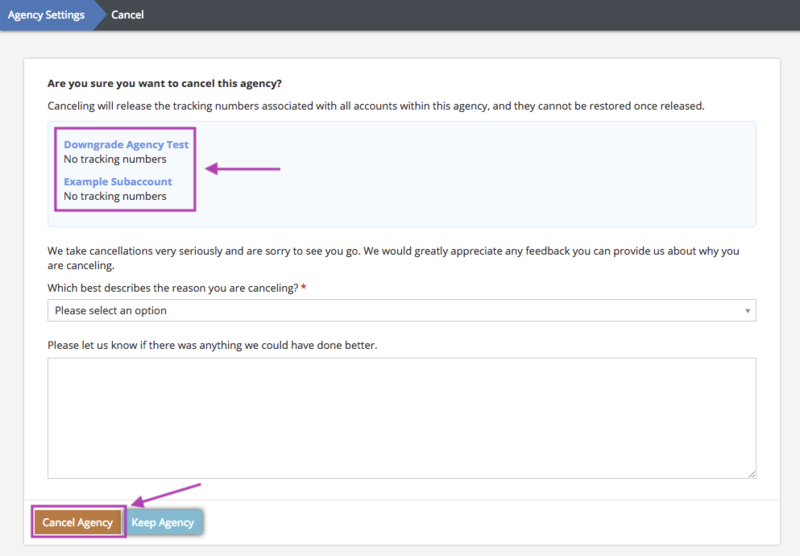 If you have an agency plan and wish to fully cancel your services with CallTrackingMetrics, follow the steps below. If any subaccounts within your agency would like to take ownership of their accounts and be moved out of your agency, follow the steps to transfer accounts before canceling. Canceled agencies cannot be restored from within your account. You will need to contact support if you wish to reactivate a fully canceled agency. Navigate to Settings → Agency Settings. Click the orange Cancel Agency… button found on the right side of the General section of the page. A confirmation pop-up will appear. Click Cancel Agency… to proceed with cancelation. 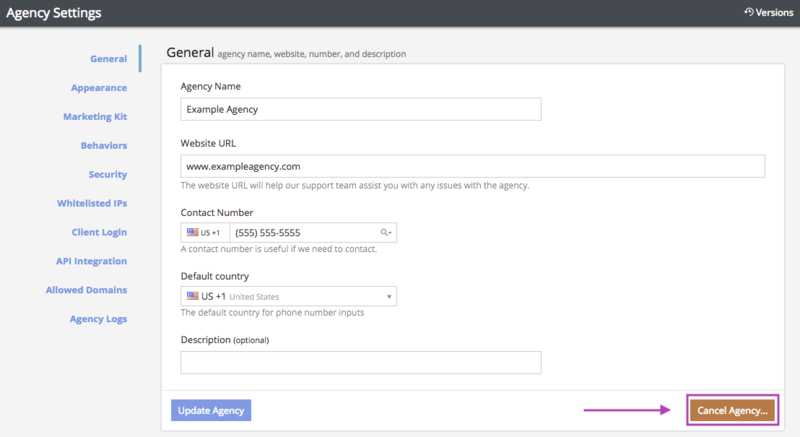 On the next page, review the list of subaccounts still active within your agency. If you wish to keep any of these accounts or move them onto separate subscriptions, do this first before canceling your agency. Please use the fields provided to let us know why you’re canceling. Your feedback helps us make CallTrackingMetrics better and is greatly appreciated. Click Cancel Agency. Your agency and all remaining active subaccounts are now fully canceled. If you need to reactivate your agency or any subaccounts, please contact support for assistance.